Occasionally we come across music that catches us off guard simply because it challenges our comfort zone; whether it is vocals that grow on you like Shilpa Ray or instrumentals that just don’t fit your music library. I was recently handed a copy of Lucy by theSpokane native Quarter Monkey. The album cover is simply bones atop a pile of rocks, inside original artwork speaks to the self development of the band. The thirteen tracks that would soon dance among the mounting chill of the season offer a unique full-spectrum of sound. Edging into Lucy, the title track ominously approaches the album with an “Astronomy Domaine” riff and crash lead-in keeping you gravitated to the next chord and what it might bring. Swimming in the depths crafted from change ups and silhouetted beats Quarter Monkey envelops a sound which is one part grunge, one part rock, and one part experimental jam. These four from the Inland Northwest don’t require a constant stream of licks and sensationalism to master their songs; they just go with the flow. Falling next in line is a little ditty about a road trip which most of the Inland Northwest can relate to. “Portland” strikes a familiar chord with “Friday afternoon 2p.m./ thoughts are drifting out/ drifting back again/ Lets take a ride and roll to Portland.” Whether you’re familiar with the trip it takes to get to the Rose City or not, the picture is plain to see with down-to-earth, unadorned lyrics. Up to this point Lucy is a relevant illustration of Spokane’s pace; mild mannered and for the most part easy going. Tony Brickner’s bass licks stand up as a noticeable piece to each track while Ty Pfundheller and Jereme Riccelli dig into west coast inspired guitar riffs that leisurely stroll along with purpose. Adding the ever important driving force Sir Janus V. Bonshaflablah (Vinnie) taps out the beats. 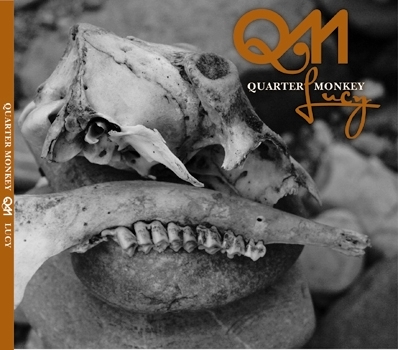 Intentionally keeping you mellow and down tempo with subdued vocals, Quarter Monkey turns on the lights with the Zack de La Rocha-like vocals in “Royal Jam.” The pace changing track is addictive and a lot less politically motivated than the comparative vocal talent. With songs like the mellow “Levitate” or the punk-jam “Heavyload,” it’s easy for these guys to embed their skewed-key, yet essential style into your memory. Taking it all home, Lucy is capped off with a jam session in “String Theory.” The multidimensional instrumental caps the album off superbly. Quarter Monkey will make you cringe, maybe stare awkwardly at your stereo, but ultimately will grow on you and fascinate the ever living audiophile out of you. The best part of a band like this is their stand alone sound; which was masterfully done at Spokane’s own Amplified Wax studio. They are a testament to all of the influence and experience musicians gather along the way while still having the ability to sound original. This entry was posted in Reviews and tagged Amplified Wax, Levitate, Lucy, music, Portland, Quarter Monkey, review, Royal Jam, Sir Janus V. Bonshaflablah, Spokane, String Theory, Tony Brickner, Ty Pfundheller, Vinnie by Greg. Bookmark the permalink.